I’ve been working on inking F.E.D.s #16, but it’s time to take a break and concentrate on my story for the SPACE anthology. (SPACE is the Small Press and Alternative Comics Expo. For information see the SPACE website.) This will be my third year participating in the SPACE anthology and, like before, I’m going to do a full-color story. I recently purchased a set of color PITT pens, and I think it would be really neat to color the whole story by hand with the pens. The difficulty is finding neat effects with only 6 colors available. I may have to break down and get a gray marker for backgrounds, but I colored this character sketch and it was a lot of fun. By the way, the story is going to be titled something like: Mutant Elf! Previous SPACE anthology comics are available as free downloads on the SPACE website. History: Omar is the son of the villain known as Lazer Ray. When Omar’s mother started a romantic relationship with his father she only knew he was an American businessman. She found out he was really a criminal and left him after she found out she was pregnant. She raised Omar secretly in a Central American country and he grew up knowing nothing about his father. Years later, Lazer Ray discovered the existence of Omar and had him kidnapped and brought to a secret island lair in the Bahamas. Lazer Ray forced Oamr to undergo a surgery to implant a bio-lazer on Omar’s right arm, in place of his right hand. 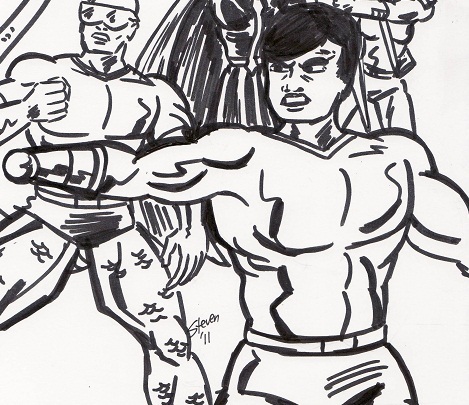 The Extra-normal heroes 1st Man and Oceanus tried to save Omar but were too late to prevent the completion of the surgery. Once Omar realized his life had been irrevocably changed he decided to use his powers for the benefit of mankind instead of following in his father’s footsteps and becoming a villain. Taking the code name Rayzap, Omar founded an extra-normal group that seeks out people who need help using and controlling extra-normal powers called the Kansas City Kids. Rayzap is the current leader of the “Kids”. Powers: At the end of Rayzap’s right arm is a device known as a “bio-lazer”. This device uses the energies of Rayzap’s body to emit energy blasts. These blasts strike targets with both concussive force and heat. It is unknown what limit in power and endurance there is to these blasts. No, I’m not talking about the primary elections, or anything like that. However, I have had two opportunities to vote in non-political areas recently, so I thought I’d put to words my thoughts about such. First is the Indie Soap Awards. You can vote for the fans’ choice indie soap of the year on via this link. http://www.welovesoaps.net/2012/01/fans-choice-indie-soap-of-year-vote.html And you are allowed to vote early and often! By which I mean you can vote once per day. I voted for Out With Dad (several times), because it is, of course, my favorite Independent soap. (Well, technically it’s the only indy soap I’ve watched. But that’s beside the point that it’s a great show and has earned the right to win this award by being such a great show!) I would hope I could convince at least one person who otherwise isn’t thinking of voting to go to the We Love Soaps site and vote for Out With Dad! It’s easy and fun! If you want to watch Out With Dad first, go to http://www.outwithdad.com/ and then vote! The second area I’ve had a chance to vote is the Comic Buyers Guide Fan Awards. I first voted in these awards back when I was in High School and CBG was a newspaper-type publication about comics, and you mailed your ballot. Comic Buyers Guide is still going strong online and in print format and their fan awards are as worthwhile as ever. From their website: http://cbgxtra.com/new-from-cbg/cbg-fan-awards-2012-nominate-your-favorites-of-2011?r=BGBFFB010512FanAwards&lid=BGBFFB010512FanAwards you can currently nominate your favorite projects and creators. I don’t read as many new comics as I used to, but I still had plenty of categories that I had clear favorites last year. The category I thought I’d discuss in this blog today is webcomic. http://www.webcomicsnation.com/jkcarrier/ladyspectra/series.php Lady Spectra and Sparky by J Kevin Carrier and friends is the story of a Mother-Daughter super hero team. The writing and art are fun and the storylines are very entertaining. There are a few super teams that are families, but this is the only Mother/Daughter super team I know of. It’s a light look at juggling parenting are crime fighting. http://www.satyrplayproductions.com/timeless.html Timeless by Mike Indovina combines Greek myths, time travel, pulp heroes, mystery, and did I mention Greek Myths? (I love Greek mythology!!) 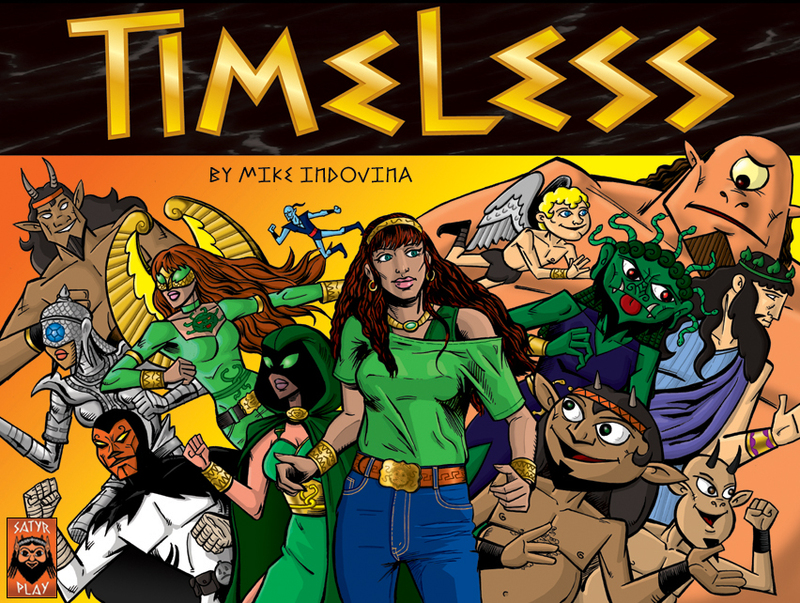 Mike does a great job keeping the story moving along with lots of surprises and has a fun way of changing his art style as the main character travels through time. The only complaint I have is that he doesn’t produce the pages fast enough! 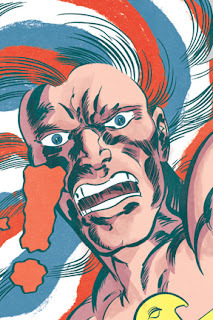 http://www.ambarb.com/?p=478 American Barbarian by Tom Scioli is another comic that emphasizes fun! Tom takes a He-Man/Masters of the Universe type hero in a mixed sci-fi/Fantasy setting (Picture dinosaurs versus giant machines) in a Kirby-esque style with cool names like “Two-Tank Omen”. American Barbarian is a blast! All the above are, of course, highly recommended by me. They’re free online so check them out! I started this blog on August 30th 2011, so it hasn’t been active for an entire year, but since the change of the calendar prompts people to reflect on the previous year, I thought I’d reflect on what I’ve done with this blog since August. A Thank You http://fedscomic.blogspot.com/2011/11/thank-you.html This was a follow up to a post I’ll discuss below. Labors of Love http://fedscomic.blogspot.com/2011/10/labors-of-love.html This was my first attempt at writing something significant rather than just another note on my artwork or a convention I'd been to. This is an essay on creator owned and produced work and why it is so impressive. When Jason Leaver (creator of Out with Dad) promoted the post and I noticed my stats climb I figured it would be the highlight of my year. Review-Nocturnal City http://fedscomic.blogspot.com/2011/11/review-nocturnal-city.html Interestingly, Nocturnal City is another creator owned and produced work. I picked up this movie before I discovered Out With Dad, but blogged about the later first because I watched Out With Dad first. I just don’t get around to watching many movies. At first I wasn’t sure this post would ever get many views, since it is a student movies very few people have ever heard of. However, once word got out among the people who worked on the project, this became a very popular post. I'm happily the only person to ever post a review of this movie on the Internet! Happy Holidays to Out With Dad http://fedscomic.blogspot.com/2011/12/happy-holidays-to-out-with-dad.html The idea for this came to me and I wanted to draw and post it because of the success of my most viewed entry (see below). What can I say? It’s nice to have people look at your work and art is how I best express my appreciation for things I enjoy! I was reading some Star Trek comics drawn by my favorite comics writer and artist John Byrne. Drawing Star Trek generally constitutes drawing a lot of likenesses, which is something that Byrne often says on his website that he doesn’t do very well. (I disagree, but that’s beyond the point of this story.) This got me thinking about likenesses and it just happened to be right about the time I discovered the webseries Out With Dad. So I started doing some sketches of the characters from the webseries as a way to practice my likenesses. I decided one of the drawings, a sketch of actress Lindsey Middleton, was good enough I might want to post it on my blog someday. It also happened to be nearing Halloween, and I was working on drawing people as zombies. So I did a zombie drawing of Miss Middleton as practice. Then I got the idea to post both the sketch and the zombie drawing as a Halloween post on my blog. One thing troubled me, though. I didn’t want to post drawings of someone without their knowledge and permission. I don’t think everyone would appreciate seeing drawings of themselves on the Internet drawn by some stranger. Some quick searching led me to Lindsey’s Facebook fanpage, however, and this gave me a way to make sure the post was okay with her. She liked the art, as I wrote about in my Thank You post, and the results were far beyond my wildest predictions! Well, there’s the top five posts as ranks by views. I’m enjoying this bloggy thing so far. It sure has led in directions I did not expect. I’m not sure what I will be posting about next year, but I plan to have some fun!